In 2014 Sarah Roy avoided the carnage of the final corner and sprinted to a dominant victory in the National Criterium Championship. The year also saw Roy complete her first professional season on the road with the French Poitou-Charentes.Futuroscope.86 squad. Picking up consistent results across the classics season. Roy claimed two top five finishes at Internationale Thüringen Rundfahrt before finishing eighth overall at Trophée d'Or Féminin. Having spent the early part of the summer criterium series showing off her Green and Gold jersey with Roxsolt, her attention turned to 2015 with Orica-AIS. Scheduled to line up at the Bay Crits, Roy was struck down with illness. After missing the first two days, Roy started stage three before realising she wasn’t fully recovered. Despite the lost preparation Roy is looking ahead to the defence of her title on Wednesday. PelotonWatch: What has it felt like wearing the Green and Gold National Champions jersey in criteriums the past 12 months? Sarah Roy: It's been a really cool feeling to wear the national championship Jersey all year. It was nice in Europe because the riders there recognise the jersey, they know what it means and it's funny they're suddenly a little bit intimated by you as a rider. The jersey definitely gave me a nice boost all season. PW: You fell ill before Bay Crits how much of an impact has missing the racing had on your preparation? SR: Not being able to race the Bay crits this year was personally quite a disappointment and obviously put my team in an a less than ideal situation having only 4 riders. I was glad to be well enough to be outside and support the girls on stage 2 where Gracie won solo and Loes came in 2nd with a late attack. They absolutely smashed that race and it was a really impressive thing to see. Makes me excited to be working with these girls in the season ahead. PW: Last year you won riding as an individual did you feel a bigger sense of accomplishment not having a team support you? SR: People do tend to compliment wins that weren't backed by a bunch of team mates but sometimes riding solo can be in your favour. I think winning a national title is an accomplishment based on a lot more than just the ride itself and I'm really proud to be able to thank my supporters through achieving it. PW: You have a big professional team in Orica-AIS to support you this year. How does that change things for you? SR: I don't only have a professional team behind me but a very supportive and trustworthy team in the Orica girls. We are in a fantastic position to do really well on Wednesday. PW: Who do you see as your major rivals for the national title? SR: Bay crits is a really good indication of form coming into nationals and I can see both Kimberley Wells and Chloe Hosking are in good shape as well as Lauren Kitchen and Peta Mullens. It's going to be a really fun race! PW: Other than missing Bay Crits what has your preparation been like? SR: My nationals preparation has been interrupted with illness but the power of a positive mind can do great things! 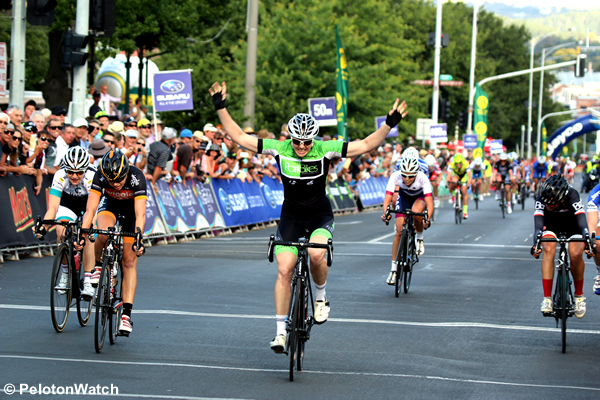 Sarah Roy claiming the 2014 Australian Criterium title.